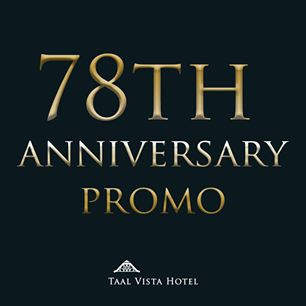 Taal Vista Hotel is celebrating its 78th Anniversary! As a thank you gift, enjoy up to 25% off on rooms. This promo also includes buffet breakfast and welcome drinks. Hurry, book now at HERE now! Get ready to be spooked on October 29, 2017, and enjoy Ghost Hunting at the Ridge! From 2pm to 6pm, join Taal Vista Hotel's Halloween Bash at the Sampaguita Ballroom. Eat snacks to your heart’s content and win special prizes! Tickets are only P900 for adults and P650 for kids (3 to 12 years old). Please call (632) 917-8225 for ticket inquiries.